They're an unlikely pair. He's a blue-blooded aristocrat from New Jersey, in the eastern U.S., accustomed to comfort and luxury. She's a wild Albertan from Canada's rugged West, used to fresh air and adventure. He grew up in an orderly world where, as long as he did his best he would be rewarded, and people could be trusted to take care of him. In her experience even a lady had to look out for herself. As a youngster she learned to forage, fight off danger and find her own place in an ever-changing group. He was respected in his field. She was just another face in the wild bunch she ran with. Yet, here they are today in B.C. 's North Thompson valley, sharing a riverside home with fine views of the Premier Range. It's not what either one expected, but they're the closest of friends, though they do sometimes argue over the feed buckets. Yes, feed buckets. For he is Irish Jimbo, a nineteen- year-old standard-bred trotter registered with the U.S. Trotting Association. His sire was Irish Jimmy, his dam Irascible. He's run on tracks in his home state of New Jersey, and in Seattle, Cloverdale, and Vancouver. When Jimbo's official racing career was over he was sold to a man in 100 Mile House, B.C., who put in his own race track so he could drive Jimbo and other trotters. Though he missed the excitement of competition, Jimbo kept in shape. 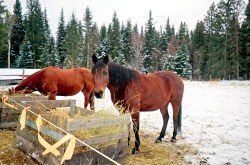 She is Kenny, a ten-year-old bay mare, part of a herd of 1,185 wild Keith quarter-horses from a First Nations reserve near Drayton Valley, Alberta. She was never broken. As a small colt she was put in a horse trailer so she would load up. Otherwise she was on her own on the range. In April 2001 Kenny was one of 165 wild horses being auctioned off. Among the crowd looking the horses over was her new owner who had no idea he'd bought a horse till he glanced round to see his partner's hand up in the air waving. They had to find a horse trailer to get her home. Kenny was pregnant and had her colt Denali that spring. That's when her training began. Later that year Kenny's owners bought Jimbo from the estate of his 100 Mile House owner. 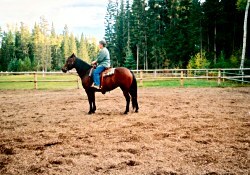 He was sold as a saddle horse. All his life Jimbo was accustomed to people; to being led, driven, fed and handled. But he'd never been ridden. When his new owner first put a saddle on him, Jimbo made it clear this was not within his job description. For a trotter, he certainly can buck. It was a trying summer for the two horses and their two people. Kenny ripped her halter off by stepping on a lead rope. She'd gone six years without being ridden and didn't think the change was an improvement. 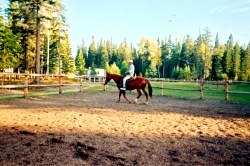 When they built a stall around her and roped her, Kenny ran and ran, hauling her new owner through the shavings and dirt of the arena. Finally they put her in the barn. She was okay in the barn, probably because she didn't think any saddles could get her there. Jimbo, of course, had been in a barn most of his life. Likely he'd never been by himself. He's a very social horse. Gradually the two horses accepted that, though their lives had changed, things weren't so bad. They began to go for rides, through town, on back-country roads and out in the hills. The surrounding mountains were new to both of them. They might have gotten some advice from Pepsi, an old gray quarter-horse where they boarded for three months in the summer of 2003. During her thirty-five years Pepsi was a packhorse for expeditions in to Berg Lake, up behind Mt. Robson, in the Canadian Rockies. Anything the new horses needed to know about mountains, Pepsi could certainly tell them. At home Kenny and Jimbo teamed up to chase bears, geese and strange dogs out of the pasture and under the fence. Together they're not afraid of anything. Jimbo is the boss horse. "Kenny just eats." says her owner. Although they've become very close, they still have different personalities. Jimbo, because of his back-ground, likes people. Kenny isn't prejudiced; she hates all people. Sometimes she's not even sure about her owners. Jimbo - So this is riding! Jimbo's always pretty sure he'll be fed. If there's no food in his bucket, he'll stand with one foot on the bucket, in a quiet, gentlemanly way. Kenny thinks, "First, you have to get their attention." She'll stand off holding her food bucket. Once, when she picked up Jimbo's bucket and her owner yelled at her to put it down, she put it on the ground, backed off a little and kept staring at it. "Let up for a minute and they'll forget about you!" is her motto. If they've been boarded out, Jimbo's always glad to get back home. Not Kenny. In fact, in April 2005, she decided not to go home at all. As her owner tells it, "I tried to catch her for four hours and couldn't, so Bob said he would rope her. On the tenth try Kenny said the hell with it and jumped the fence and went back into the herd of thirty-two horses." Maybe they reminded her of the wild herds she knew. There she stayed for another three weeks, leaving Jimbo all alone. On the day Kenny finally came home Jimbo couldn't believe she was back. "Jimbo was out by the barn," says her owner, "when Bob drove into the yard with Kenny. When Bob backed the trailer in and Kenny came out of the trailer, Jimbo jumped up and down. He ran out into the pasture to the spot where he always rolls and rolled as fast as he could. He ran over to Kenny and smelled her to make sure it was her. Then he ran back out to their field and rolled, then ran back to Kenny. He's been there ever since."